Before the Toyota Prius and Honda Insight opened the green road of hybrid cars, another Japanese model, namely the Nissan Tino, was laying the first inches of pavement. 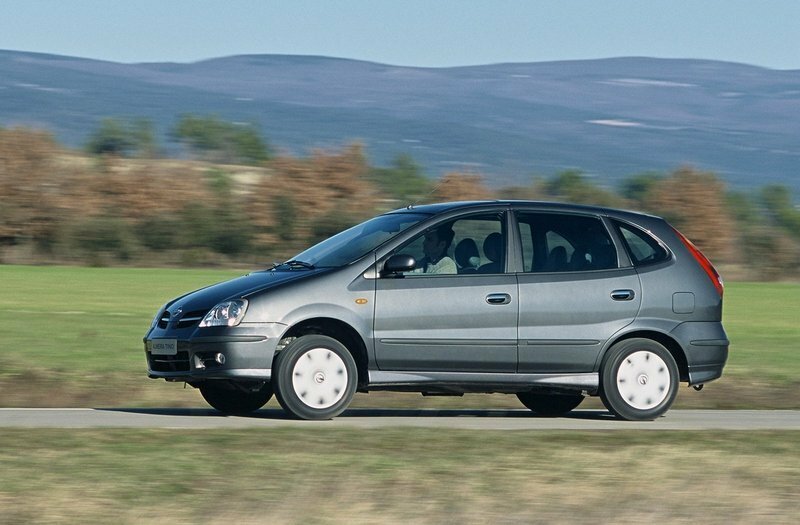 But unlike the Prius and Insight that were built from the ground up as hybrids, the Tino was just a normal passenger car fitted with Nissan’s NEO HYBRID system. The standard Tino was released in 1998, while the Hybrid arrived two years later in 2000. The vehicle was produced in a limited number of 100 units and was available solely on the Japanese market, being considered by many as only a prototype used to test the public’s reaction to this type of technology. Compared to its gasoline-engine brother, the Tino Hybrid improved fuel economy by more than twofold, while also cutting carbon dioxide (CO2) emissions by over 50%. Hit the jump to read our full review on the Nissan Tino Hybrid. 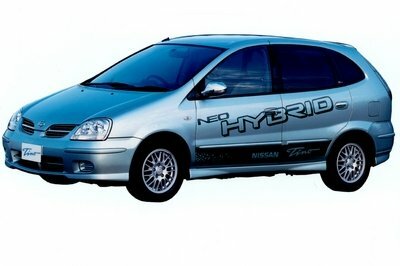 The 2000 Nissan Tino Hybrid kept the same exterior design language as its conventionally-powered sibling. The vehicle was built with utility and practicality in mind, so its exterior design is another interpretation of the “form follows function” concept, a common procedure found in this class. The front end is pretty rudimentary and features Nissan’s old signature kidney grille fitted with the company’s badge in its center. The grille is flanked by a pair of big headlights which continue the dull design language that dominates the entire body. The bumper isn’t something to rave about either, but copes well with the hood lines and the front fenders. Talking about fenders, they are united by a dynamic crease sculpted into the front and rear doors, giving the profile a sleeker look. The same line follows the rear fenders contour and gels seamlessly with the rear bumper. Out back, we are met by a pair of oval taillights placed vertically along the rear pillars. There is also a generous glass area which gives you great road visibility and a wide opening roof-hinged tailgate that offers easy access to the boot. 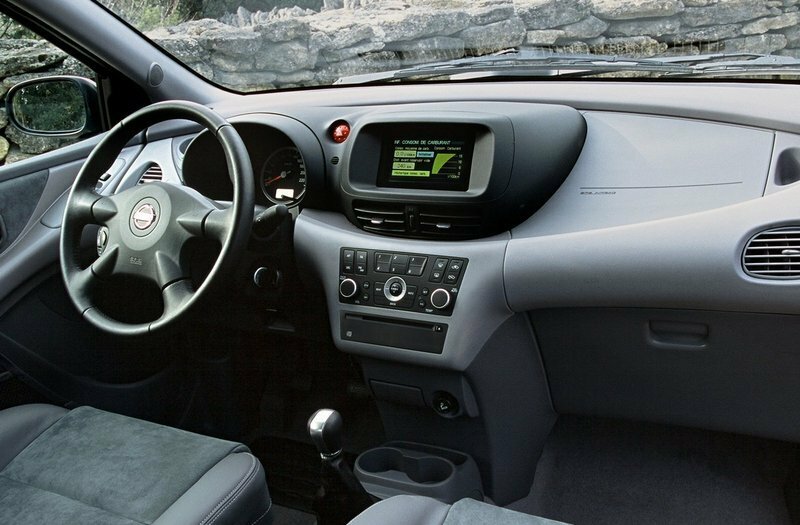 The Nissan Tino was built as a family car, so the cabin rewards you with acres of space. 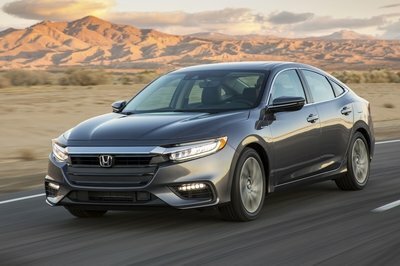 Fortunately, the hybrid system didn’t affect the interior space, so the car continues to offer the same roominess as its conventionally-powered sibling. 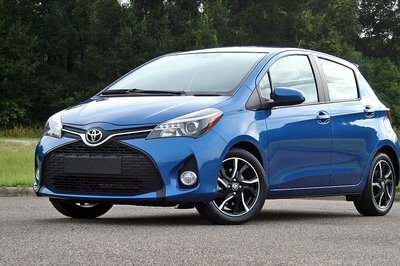 The seats are also pretty supportive and offer plenty of leg and head room, but they have limited adjustments and could’ve come with better side bolstering. On the other hand, the steering wheel is well placed and features an ergonomic design. It’s focal point is to give you perfect hand position, allowing for optimal grip, but it also features just enough control buttons to handle some of the car’s more important features. Once you get cozy behind the four spoke steering wheel, you are also met by a pretty clean instrument cluster which keeps you informed about the various vehicle stats. Additionally, in the center of the dash, there is a 5.8 inch liquid crystal multifunction display that enables you to know at a glance the operating conditions of the engine and motor, as well as instantaneous and average fuel consumption figures. The navigation functions are also provided through the same monitor. The materials found in the Tino Hybrid were good for the class, if not slightly better than expected. Some cheap plastics were still present, especially around the center console, and most of the buttons had a pretty flimsy feel. At least, every control was placed within easy reach and you’ll also find plenty of cubbies and storage places to keep your things. The Nissan Tino Hybrid is equipped with a 2.5 liter 4 cylinder engine which cranks out 101 hp. 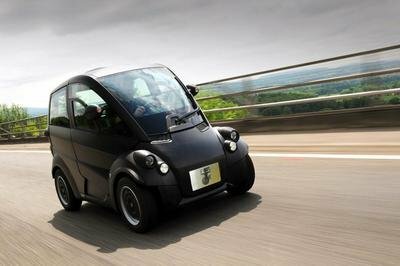 The gasoline unit is combined with a 40 hp electric motor which drives the car at low speeds, which isn’t too much a negative because the Tino is mostly used for city driving. The start is pure electric, with the Tino Hybrid lacking the familiar noise found in conventionally-powered cars. When the vehicle drives on pure electric mode, there is a green “Ready” light on the dashboard and a handy graphic display that shows what part of the underhood system is powering the car. 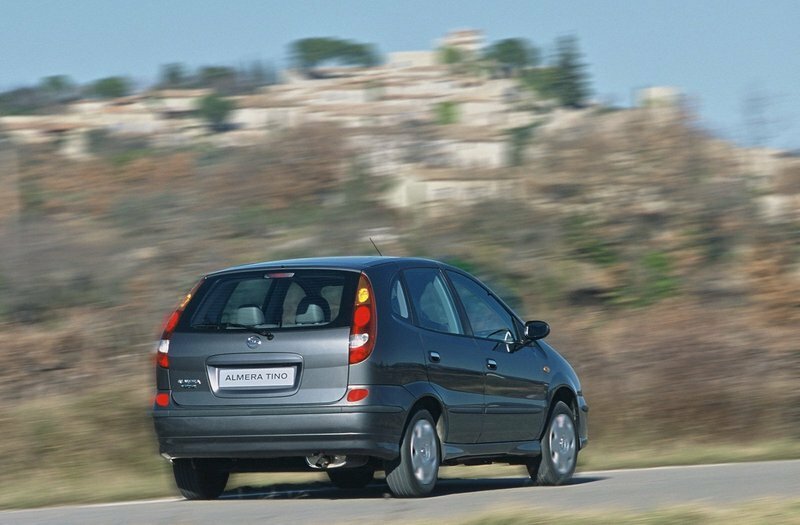 As you step on the gas harder, and the speedo’s indicator starts to move up, the petrol engine slightly takes control, keeping the vehicle’s performance high. Apart from the hybrid system, the green Nissan Tino is also equipped with regenerative breaks which use every deceleration to charge the electric batteries, and to offer extra range. Talking about range, the Tino Hybrid can cruise up to 600 miles on a single tank, which is pretty impressive. 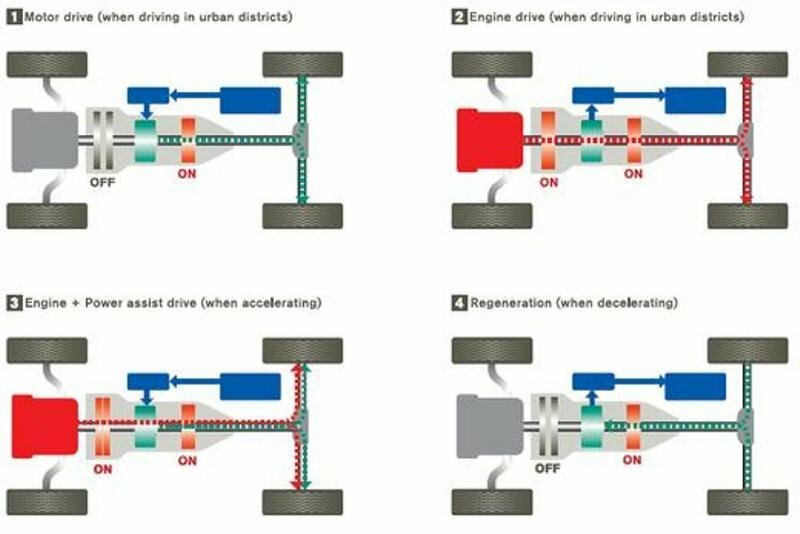 Power is directed to wheels through Nissan’s HYPER CVT continuously variable transmission which allows both the engine and the motor to operate at high efficiency and offers a smooth and accurate response. 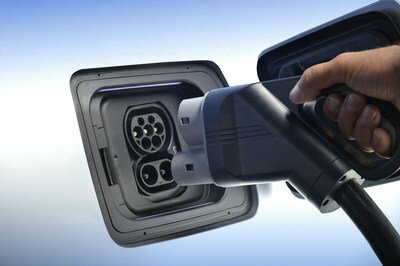 To further increase efficiency, the engine is turned off automatically every time the vehicle is stopped. The battery pack is placed under the floor, so interior space wasn’t affected. This layout also gives the vehicle a better stability during cornering, as it keeps the center of gravity to a relatively low level. 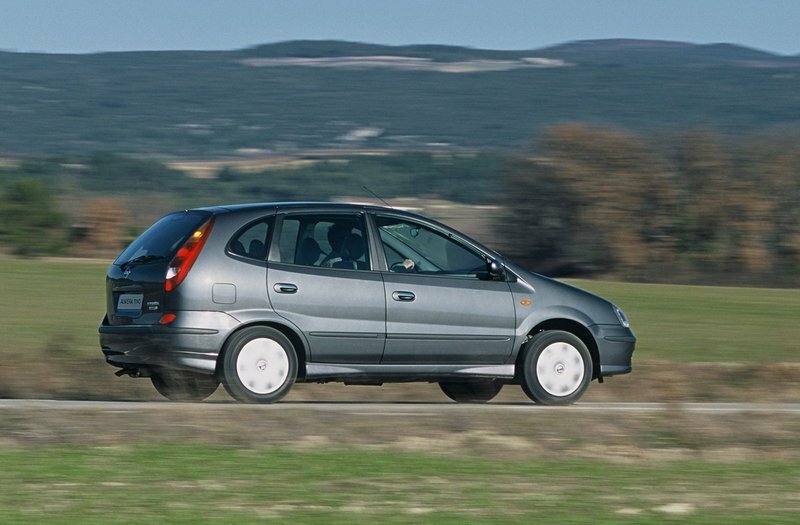 The Nissan Tino was a no-nonsense hybrid vehicle and despite the fact that it wasn’t as advanced as the Toyota Prius or Honda Insight, it was still fairly efficient and delivered decent on road performances. Furthermore, the introduction of the hybrid system didn’t affect the interior space, so the green Tino continued to offer the same level of comfort as its petrol-powered sibling. Even if the Nissan Tino Hybrid was built in limited production, it helped the company gather enough data for their future hybrid systems and served as a strong base for the new Nissan Leaf which is currently one of the most appreciated hybrids in its class. 600 miles on a single tank? We’ll take it!